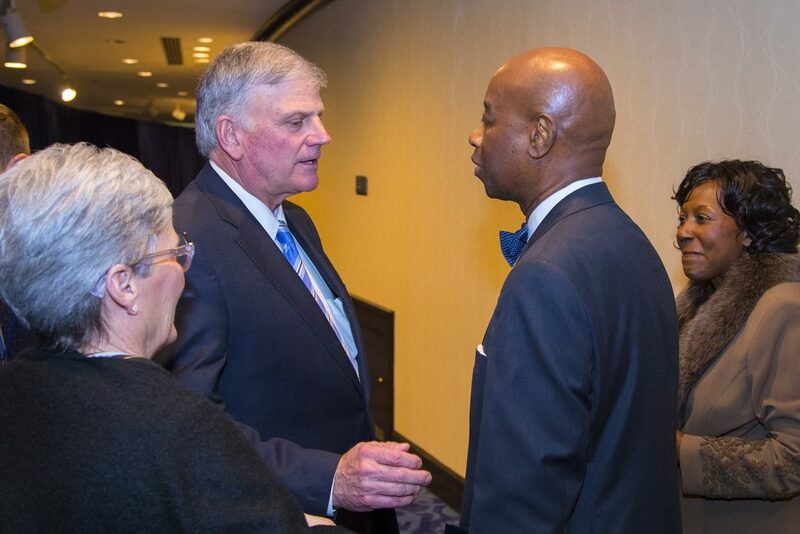 Franklin Graham and his wife, Jane, talk with Senate Chaplain Barry Black and his wife, Brenda, at the National Prayer Breakfast on Thursday. Black was the keynote speaker at the event. 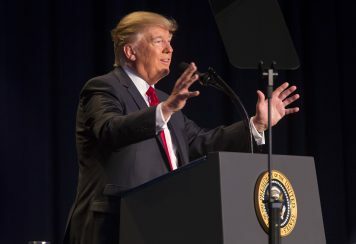 Politics took a backseat to prayer on Thursday morning as many Democrats and Republicans joined President Donald Trump for the National Prayer Breakfast in Washington, D.C.
That was the goal on Thursday. 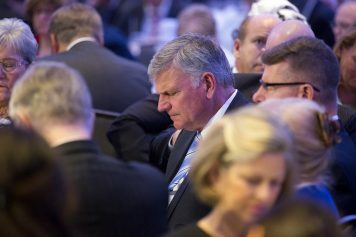 Franklin Graham was among many men and women who prayed for the nation at the National Prayer Breakfast. Franklin Graham was among the many honored guests who attended the prayer breakfast, which was first held 64 years ago under President Dwight D. Eisenhower’s administration. It was then that Franklin Graham’s father Billy Graham worked alongside Abraham Vereide, Senator Frank Carlson, hotel magnate Conrad Hilton and others to establish the event. To this day, the prayer breakfast is held in Hilton’s Washington, D.C., hotel. During Thursday’s breakfast, every speaker zeroed in on the importance of prayer. Senate chaplain Barry Black, the keynote speaker, employed many Bible verses, including the same Scripture Franklin Graham shared on Inauguration Day. “Mr. President, you may be familiar with this Scripture because it was read at your inauguration, but it is so spot on,” Black said, referencing verses from 1 Timothy 2:1-4. “We need to pray for everyone, all people,” urged Black, a retired rear admiral who served 27 years in the United States Navy. “Ask God to help them; intercede on their behalf and give thanks for them. Pray this way for kings and all who are in authority so that we can live peaceful and quiet lives marked by godliness and dignity. This is good and pleases God our Savior who wants—hear this—who wants everyone to be saved and to understand the truth. President Donald Trump addressed the crowd and talked about the importance of religious liberty. President Trump followed Black’s impassioned message with one of his own. 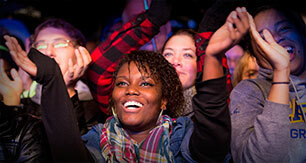 He stressed America will thrive as long as its liberty, particularly its religious liberty, is allowed to flourish. “As long as we have God, we are never, ever alone,” Trump said. “Whether it’s the soldier on the night watch, or the single parent on the night shift, God will always give us solace and strength and comfort. You can be secure in Christ today.